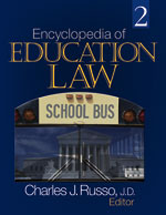 The Encyclopedia includes selections from key legal documents such as the Constitution and federal statutes that serve as the primary sources for research on education law. At the same time, since education law is a component in a much larger legal system, the Encyclopedia includes entries on the historical development of the law that impact on its subject matter. Such a broadened perspective places education law in its proper context in the U.S. legal system.